Manager With In-Built Editor for the Waldorf Pulse 2 Analog Synthesizer. This started as a personal project as I was in need of some patch manager/organizer for my Waldorf Pulse 2 Analog synthesizer, which I had to eventually undertake myself, as I was quite disappointed with the lack of patch management feature set in what so little is available in market for this wonderful little synthesizer. After Completing Basic Librarian, I decided to also add a native Pulse 2 Editor. Specifically (Personally) Designed for Faster Workflow. Send / Request Dumps: Complete Automatic Backup/Restore of Your Pulse 2. Patch Category Display: It shows you patch category on each patch slot, you can also filter patch list for any category. Patch Browser (v 1.1.0.0): Use the Patch Browser to Find any patches in your entire library. learn more..
Patch Central (v 1.2.0.0) : Share, Preview, Download Patches from Onloine Patch Database/Repository. learn more.. 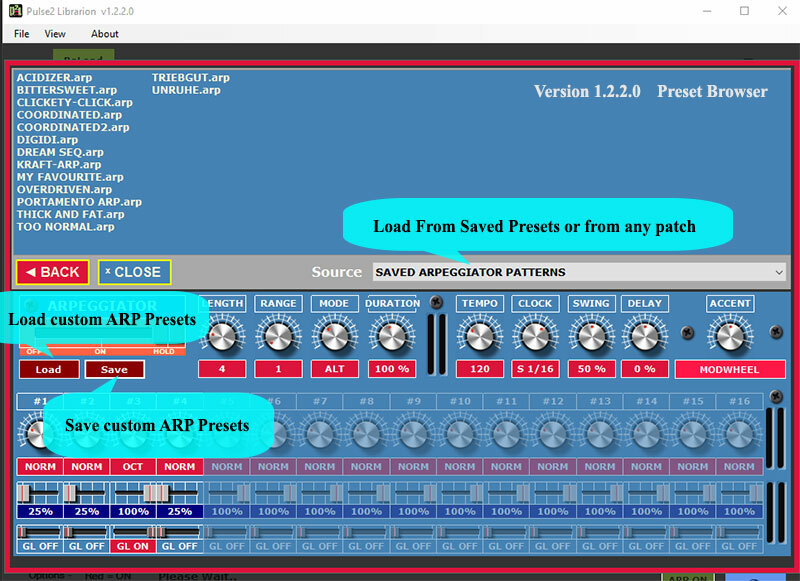 Trigger Maps: Trigger Maps are Midi triggers Mappings for patch Slots. You can assign Midi Notes and CC to patch locations and Trigger instant Patch changes though midi (input port 2). Learn More..
e.g. After you’ve made some changes on Pulse 2 and like the sound; Hit a patch and it retrieves and stores the current sound in that location, It’s great to quickly build the variations while your creative juices are flowing. Bulk Editor Mode : Instead of the standard right click menu to Edit a Patch, All Patches Become One Click Editable (In the Patch editor), saves unnecessary clicks when you need to edit many patches. Write to Pulse mode (Be Cautious) Writes the Clicked Patch instantly to Pulse 2 memory as the Same Location of the Patch. ARP Disable Option Button to keep Sonic Chaos in check. Auto Random Patch Name Generation option on buffer receive. until you come up with something you like. TIP:Don’t like the name, click the slot again to load the same sound but with a different random name. 4. Don’t forget to Save your bank!! colors to make it easier to locate and reach the parameters. while Shift + Click : RESET the knob to default values.